A contract is a promise by one party to provide goods or services to another party in exchange for money or some other agreed upon consideration. A contract does not necessarily have to be in writing. Michigan law recognizes the "freedom of contract". This means that you can agree to anything as long as it is not criminal or otherwise illegal. 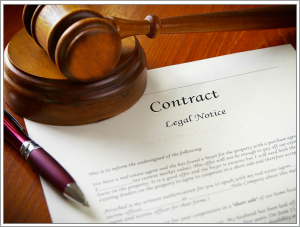 Contracts do not have to be fair or reasonable to be enforceable. If your contract is not clear or complete, the law will supply terms that you may have never thought of and to which you would not have agreed. Ron Greve and Douglas Dinning can draw up contracts that will protect your legal rights and can help you negotiate more favorable terms. In a business setting, Ron and Doug can prepare form contracts that will limit your liability and clearly spell out the obligations of all parties. If you have a dispute or someone refuses to pay, Doug or Ron can take actions to protect your legal rights, including going to court to collect what is owed to you. Contract disputes can also involve complaints to government agencies such as the local building inspector, the police, the Attorney General, the Health Department, MIOSHA, the Wage and Hourly Division, various State licensing boards, etc. Ron and Doug have years of experience dealing with the government both on behalf of the person complaining and the business or individual who is the target of the complaint.